The Davies Craig EWP115 Electric Water Pump and Electric Pump/Fan Digital Controller Combo (Part Number 8030) is a simple, do-it-yourself, easy to install, kit designed to complement or replace your existing belt-driven, mechanical water pump and engine thermostat. The EWP115 will fit most vehicle makes and models fitted with naturally-aspirated or turbo engines up to seven liters (429 cubic inches). The revolutionary, Australian-designed EWP115 is made from anti-corrosive, lightweight, heat-resistant, glass-filled nylon and incorporates a ceramic faced impeller seal for long-life durability. The EWP115 greatly enhances engine cooling control while giving you added power and improved fuel economy. By removing the parasitic power losses of a belt-driven, mechanical water pump the EWP can provide up to 10kW (14HP) of extra power and increased torque. The Electric Water Pump and Fan Digital Controller will manage both the Water Pump and Thermatic fan operations. The Digital Controller will vary the speed of the Water Pump in response to the engines coolant temperature. Five temperature settings are provided on the Controller for either maximum power or fuel efficiency. The Thermatic Fan/s will be activated automatically once the engine coolant rises 3°C (5.4°F) above the targeted (set) temperature. The Digital Controller will automatically run on for two minutes (or to 5°C/9°F below the set temperature) after engine shut down, eliminating heat soak and extending engine life. The EWP115 Digital Controller Combo is supplied in a do-ityourself kit for fitment to your vehicles engine, including an easy-to-follow DIY instruction booklet. Height: 84mm (3.31 inches). Width: 128mm (5.04 inches). Inlet Opening: 38mm (1.50 inches). Pump weight: 980 grams (2.16 lb). Operating voltage: 3V DC to 15V DC. Operating temperature: -40° to 130°C (-40° to 266°F). 3,000 hours continuous at 80°C (176°F) and 12V DC. 7,000 hours with an EWP/Fan Digital Controller (included). Pump material: Nylon 66, 30% glass-filled. Burst pressure: 500 kPa (72.5 psi). Fits hose sizes: 38mm to 51mm (1½ to 2). The EWP® is a recirculating pump which is ideal for a closed system similar to an automotive cooling system; it is not self-priming. Technical Specifications for Pump / Fan Controller. Width: 95mm (3.74 inches). Depth: 35mm (1.38 inches). Weight 90 grams (3.2 oz). Input voltage: 12V DC to 15V DC. Output voltage: 5V to 15V. Operating temperatures: -20° to 60°C (-5° to 140°F). Targeted (set) temperatures: 75°C, 80°C, 85°C, 90°C and 95°C (167°, 176°, 185°, 194° and 203°F). Fan cut-in temperature: 3°C (5.4°F) above the targeted (set) temperature. Controller type: PCB with microprocessor. Sensor type: Thermister in housing. Time-out: 2 minutes maximum or set -5°C (23°F). Indicator LEDs: Temperature, power, pump, test, fan. Kit Contents: EWP115 Pump, Digital Controller, instructions, wiring harness, In-line adapter, sleeve rubber adapters (4), hose clamps (4), thermal sensor, led with pigtail. I'm happy to answer any questions. The item "Davies Craig 8030 EWP115 Remote Electric Water Pump Kit" is in sale since Sunday, April 20, 2014. 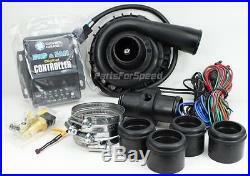 This item is in the category "eBay Motors\Parts & Accessories\Car & Truck Parts\Cooling System\Water Pumps".
" and is located in Marietta, Georgia. This item can be shipped worldwide.